This lovely walk across water meadows, deer park and woodland is stuffed full of history – Runnymede, site of Magna Carta’s signing, Windsor, centuries-old seat of monarchy, and even a short visit to the USA. 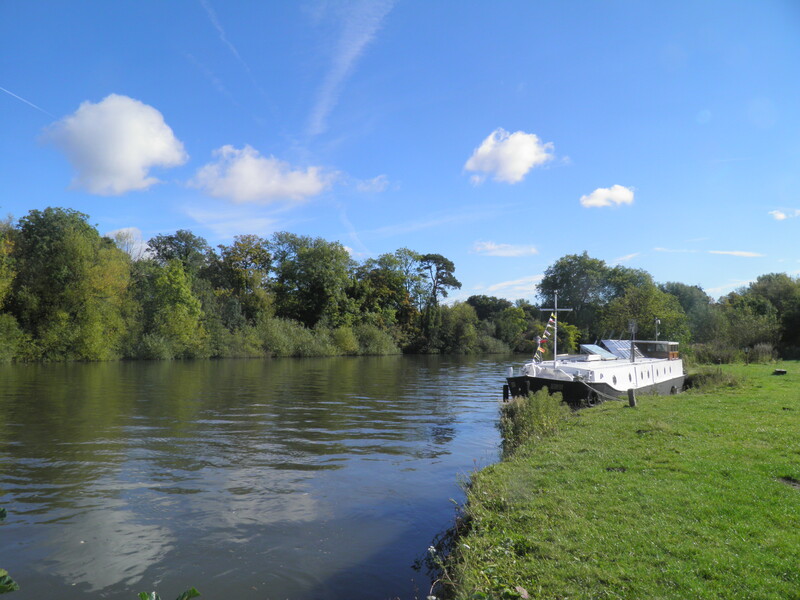 Underfoot: Some of the early paths along the Thames and through Runnymede’s meadows could be muddy after rain. The rest of the route is almost entirely on minor roads and firm paths. Terrain: A relatively steep climb from Runnymede up to Bishopsgate, but all other climbs and descents are very gentle. 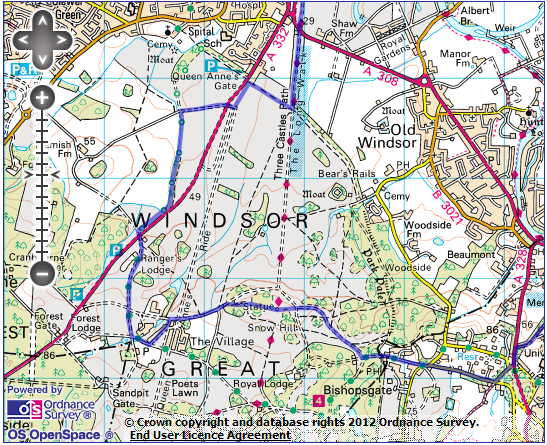 Maps: 1:50,000 Landranger 175 Reading & Windsor; 1:25,000 Explorer 160 Windsor, Weybridge & Bracknell. Getting there: South Western Railway operate 4 trains per hour (3 per hour on Sundays) from London Waterloo (37 mins) via Clapham Junction (29 mins) for London Overground and connections from London Victoria and Richmond (21 mins) for London Overground and District line. 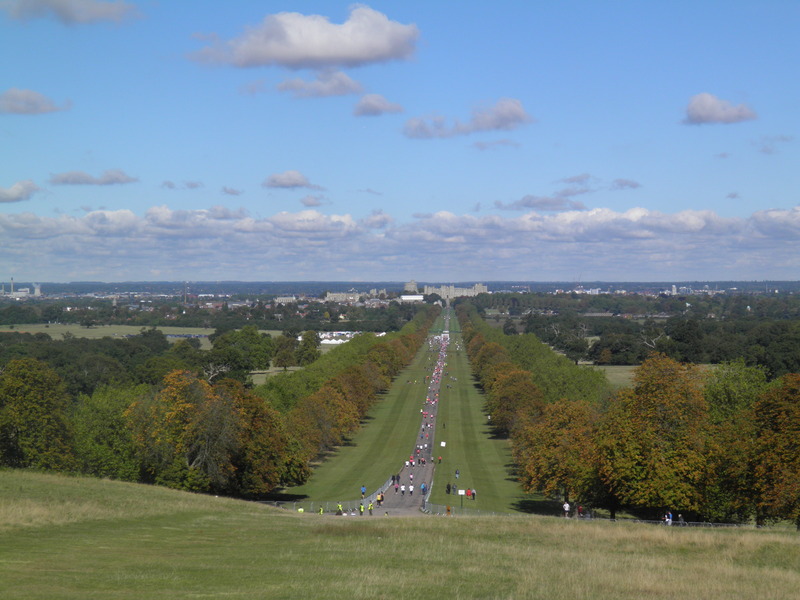 Useful websites: The route passes through the National Trust land at Runnymede, through Windsor Great Park, and ends by Windsor Castle and Windsor & Royal Borough Museum. 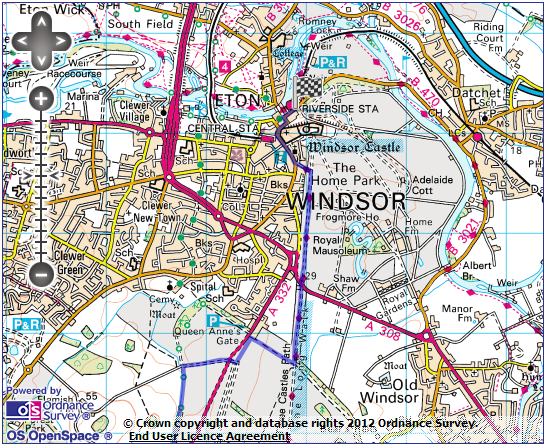 Getting home: Windsor has two stations, both with routes to London. Windsor & Eton Riverside has 2 South Western Railway services per hour to London Waterloo (56 mins), via Richmond (35 mins) for London Overground and District line, Clapham Junction (46 mins) for London Overground and connections to London Victoria, and Vauxhall (52 mins) for Victoria line. Alternatively, Windsor & Eton Central has 3 First Great Western shuttles services per hour to Slough (6 mins), from where there are frequent connections to London Paddington. Total journey time to Paddington, including connection, is between 32 and 42 minutes. Fares: Purchase a London to Windsor & Eton off-peak return for £9.50 (£4.75 child, £6.25 railcard). 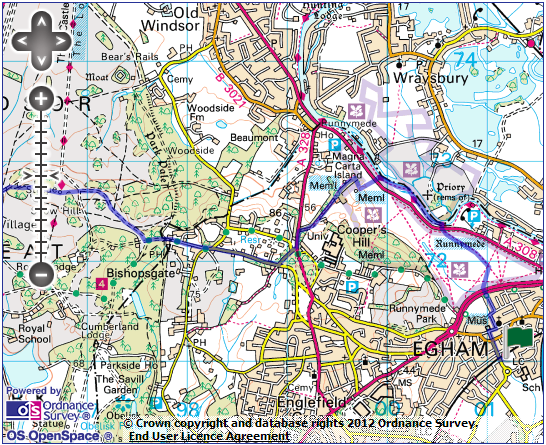 In addition, for the outward journey, you will need a Staines to Egham single for £2.50 (£1.25 child, £1.65 railcard). platform and turn right on road, pass over the level crossing and continue straight ahead to reach traffic lights. Cross Church Road at the pedestrian crossing, and cut through straight ahead to join Station Road North. 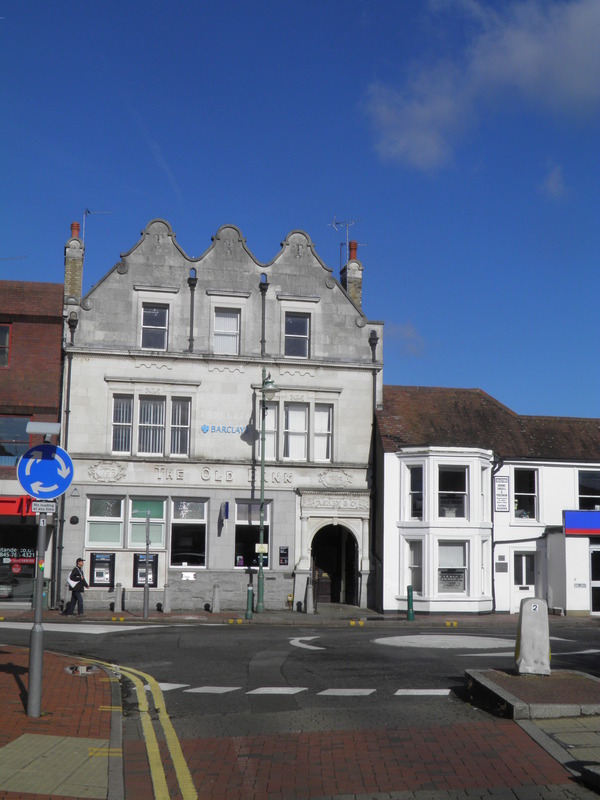 Continue straight ahead to the junction in front of a late 18th century building inscribed with ‘The Old Bank’. Confusingly, it is still a bank! Turn right on High Street, passing the Magna Carta themed 20mph signs. Turn left on Runnemede Road, squeezed between the Red Lion and the sweet little brick United Church. Follow road round the corner to the right, and then take the first left, still called Runnemede Road. On reaching the A30 dual carriageway, head very briefly left to reach a break in the crash barrier that allows you to dogleg across the central reservation. On the far side, drop down the bank and onto Runnymede Meadows. 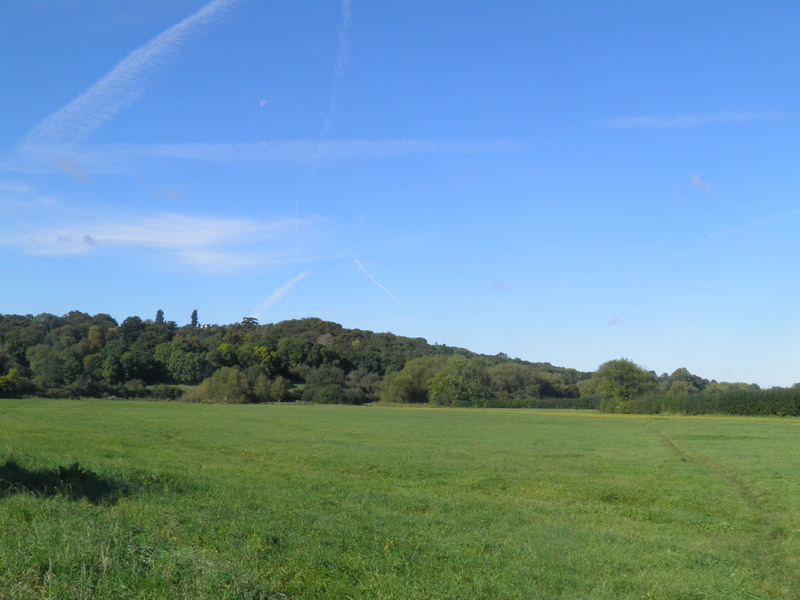 Runnymede, in the ownership of the National Trust since 1929, comprising 188 acres of Thames floodplain, mainly comprised of alluvial pasture interspersed with dotted woodland. 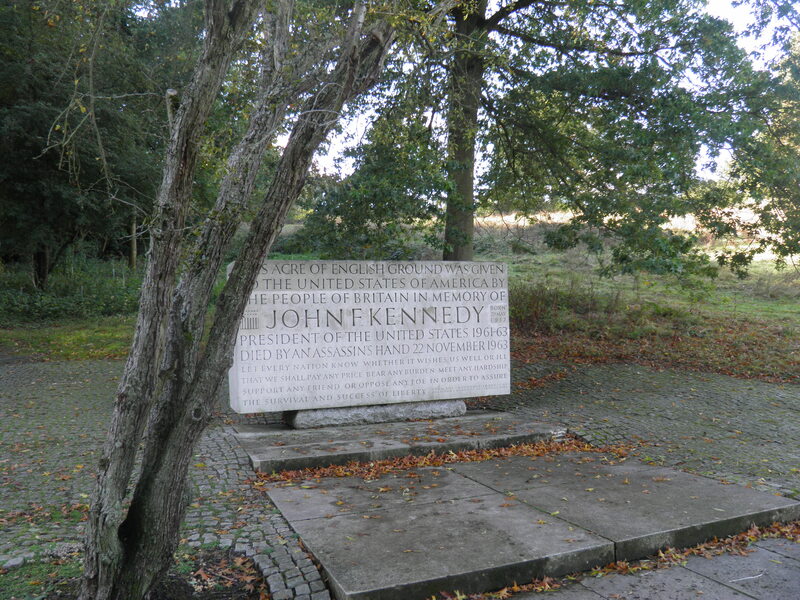 There is evidence of a long history of Runnymede being associated with political activity – the name probably comes from the Anglo-Saxon ‘runieg’ meaning ‘regular meeting’. The witenagemot of the Anglo-Saxon kings – a frequent, often open-air meeting, which was the precursor of the modern parliament, was held at Runnymede on several occasions. Whilst there is no certainty that Runnymede was the location of the sealing of Magna Carta in 1215, it is certainly the most likely location. Take the right hand of the 2 faint paths across the grass. 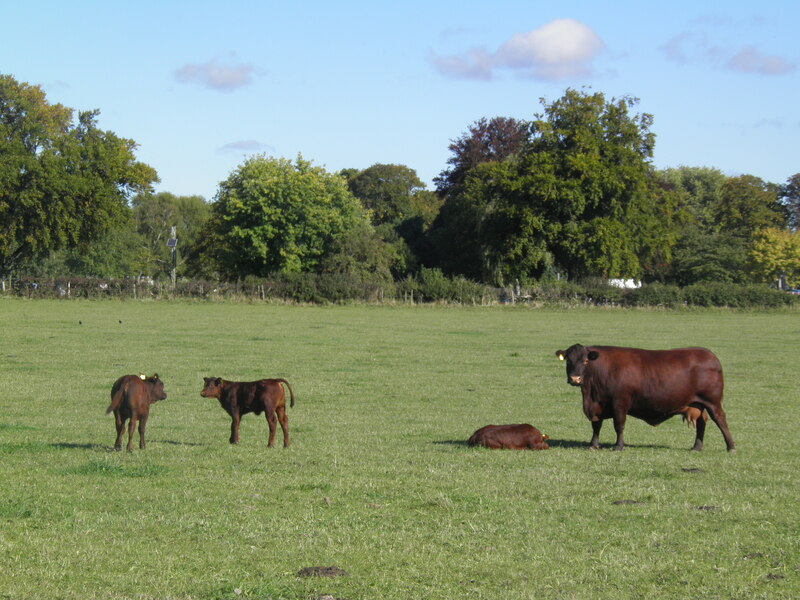 At a junction of grassy paths by the corner of a hedge, head left, beside the hedge, to pass through a gate into another large field, often grazed by herds of cows. Continue on the clear path straight ahead. At the end of the field, pass through a kissing gate and cut right through a second gate to the busy A308. Cross to the broad riverside path beyond and head left. As you pass a footpath sign pointing left, glance up to the hilltop to see the Airforce Memorial. 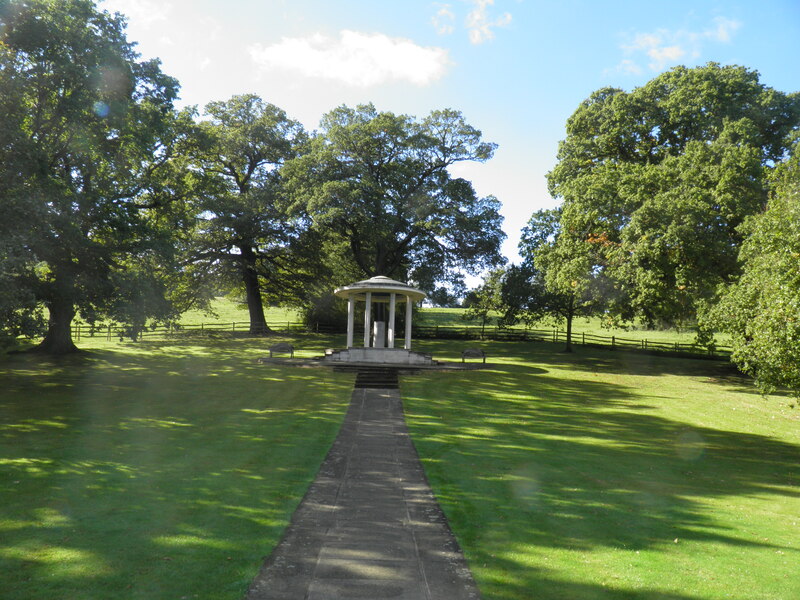 The Memorial, whose tower can be seen among the trees on the summit of Cooper’s Hill, follows a design by Sir Edward Maufe and comprises a shrine and colonnade. Opened by the Queen in 1953, it commemorates the 20,000 UK-based airmen and women who died during World War II and who have no known graves. 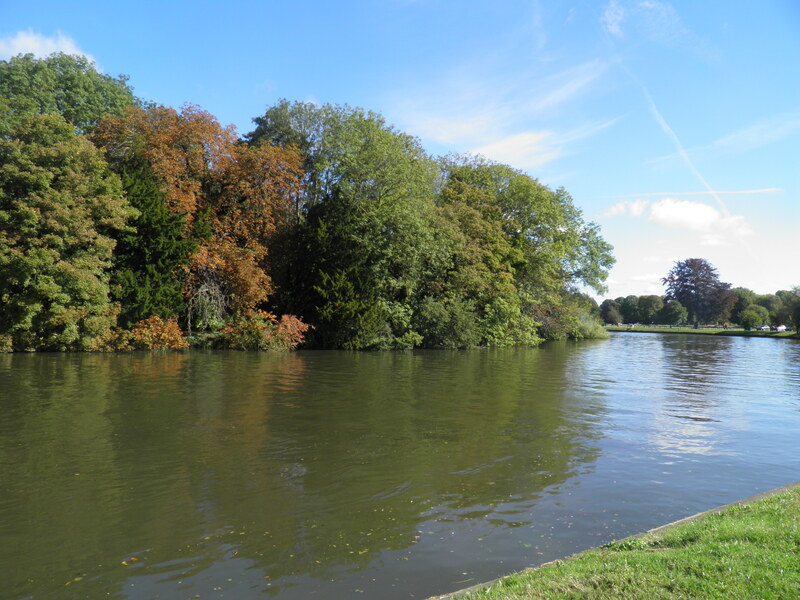 Where the path returns to the river bank, the opposite shore is Magna Carta Island. commemorative cottage being built on the island which contains a stone on which Magna Carta is said to have been signed. It is more certain, however, that the island was the site of a meeting two years later, in 1217, between King John and Louis of France, pretender to the English throne, where a peace deal between the two was forged – this perhaps adds some weight to the Magna Carta theory! As Jerome K Jerome puts it in his comic novel Three Men in a Boat, “As far as my own personal opinion goes, however, I am inclined to give weight to the popular island theory. Certainly, had I been one of the Barons, at the time, I should have strongly urged upon my comrades the advisability of our getting such a slippery customer as King John on to the island, where there was less chance of surprises and tricks.” The island is now linked to the shore via a bridge to the north bank of the Thames. straight across the field beyond towards the domed Magna Carta Memorial. This domed classical temple was constructed in 1957, on land leased from the Magna Carta Trust to the American Bar Association, paid for by donations from 9,000 American lawyers. Like the Airforce memorial, this too was to a design by Sir Edward Maufe. Under the dome is a pillar of English granite, inscribed with the words ‘To commemorate Magna Carta, symbol of freedom under law’. The route heads R in front of the entrance to the Memorial. Where a paved path heads uphill to the left, through a kissing gate, follow it. The gate, as explained by the neighbouring information board, technically marks the entry to US owned-territory. Climb the path and the ‘steps of individuality’ to the memorial. Beyond, continue on the path climbing at the back of the memorial. Past a large house, you join its surfaced drive which eventually climbs, fairly steeply, to the A328. Cross and turn left on the pavement, climbing to a road junction. Turn R and keep to the left hand fork on Castle Hill Road. Pass through the woods and at a crossroads head right on Bishopsgate Road. This is relatively busy, but has a pavement throughout. and straight ahead again at the next junction on a quieter road into Bishopsgate village. Pass the Fox & Hounds pub, set back slightly from road, and a little beyond you pass through white gates into Windsor Great Park. 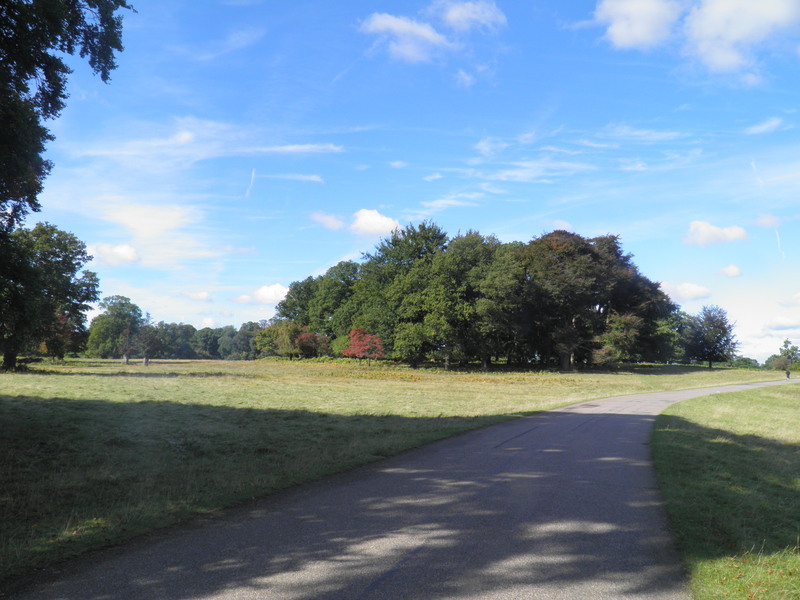 Windsor Great Park comprises 5,000 acres of varied landscapes, including classical parkland, a ‘wild’ managed deer park, gardens and farmland. 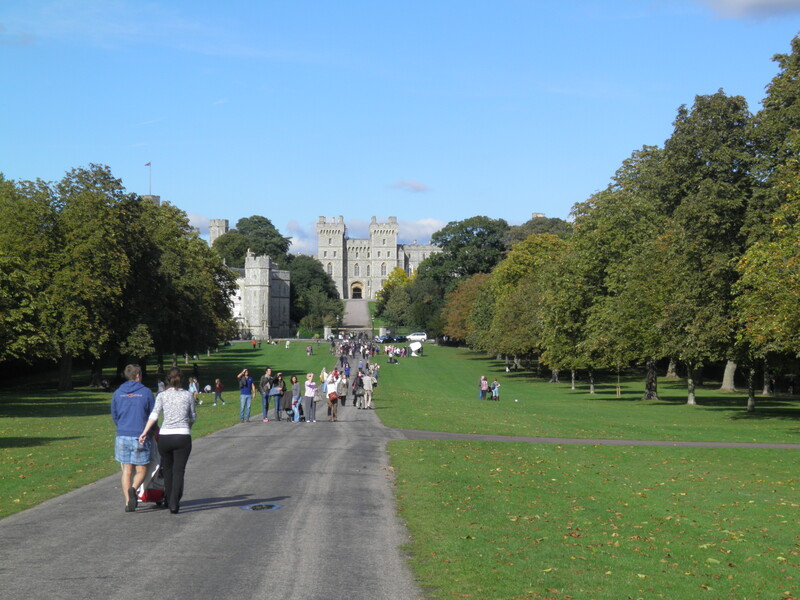 The park was first established when Windsor became a royal residence in the 11th century, and gradually grew as a resource to supply Windsor with wood, meat and fish. Over time, the park’s utility for supplying the monarchy decreased and it became more of a recreational hunting ground. It remained under direct royal ownership (save for a brief privatisation by Oliver Cromwell) until the late 18th century, when George III transferred management of royal lands to parliament. It is now managed by the Crown Estate. Having been used as the road cycling venue for the 1948 Olympic games, the park was gradually opened to the public during the 1950s. The first grounds you walk through are those of the Royal Lodge, built as a Deputy Ranger’s House, before becoming a residence for the Prince Regent in 1812. Following a renovation in the 1930s, it is now the official residence of the Duke of York. As you approach the gatehouses of Royal Lodge, head right at a junction of roads, passing through a gate into the deer park. The road swings around the hillside, with occasional glimpses through trees of Windsor Castle, Eton College and Slough below. The road drops gently to cross a bridge. Immediately beyond, take a grassy path climbing left at a slight angle towards the rocks and statue on top of Snow Hill. 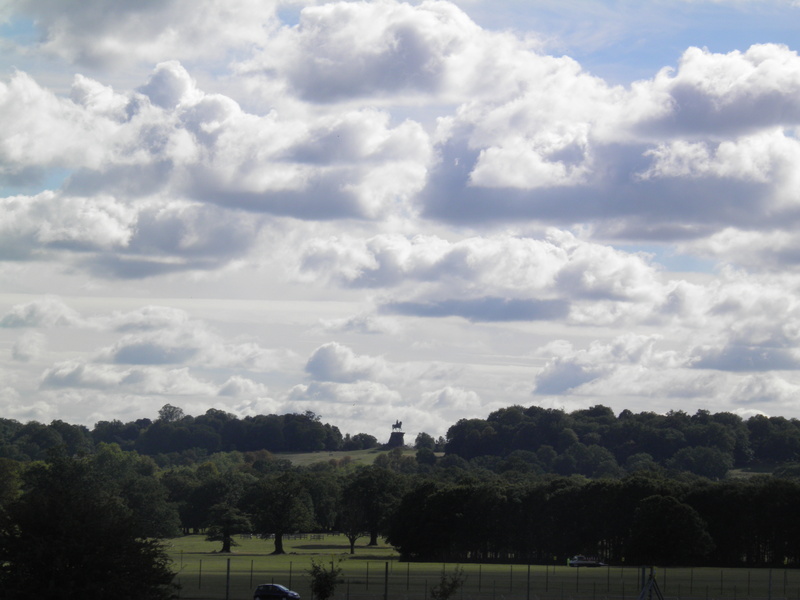 From here, views are spectacular – straight down Long Avenue to the Castle, the Chilterns beyond Queen Mother Reservoir, the towers and terminals at Heathrow, and beyond those, the skyscraper cluster of the City and the Wembley Arch. Known as ‘The Copper Horse’, the dramatic equestrian statue of George III on the top of Snow Hill was commissioned by his son, George IV. The Latin inscription translates as ‘The best of fathers’, despite the relationship between the two Georges (like most Hannovrian father-son relationships) being utterly disastrous. 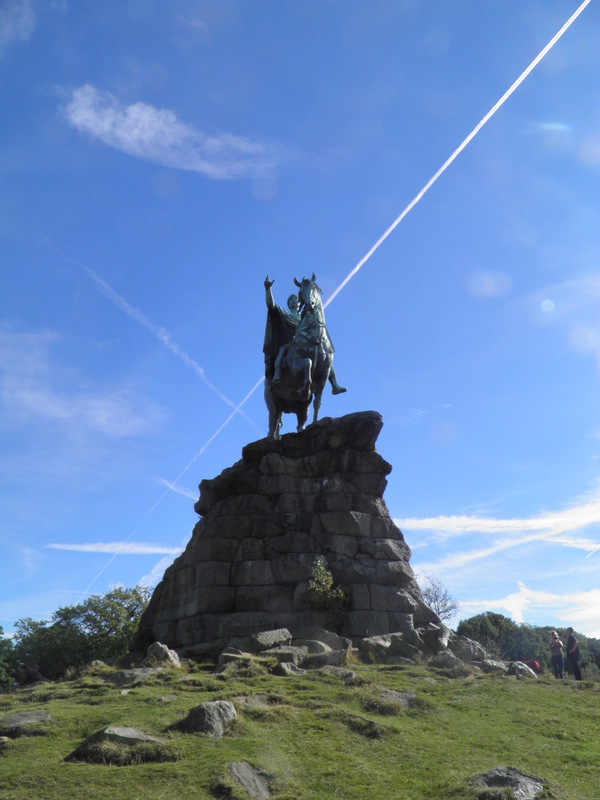 The statue marks the southern end of the Long Walk, a two-and-a-half mile long avenue which runs dead straight to the George IV gateway at Windsor Castle, originally laid out and planted by Charles II and William of Orange. Its original double row of elms was chopped down in World War II. ride drops through bracken and then trees to rejoin a metalled road. 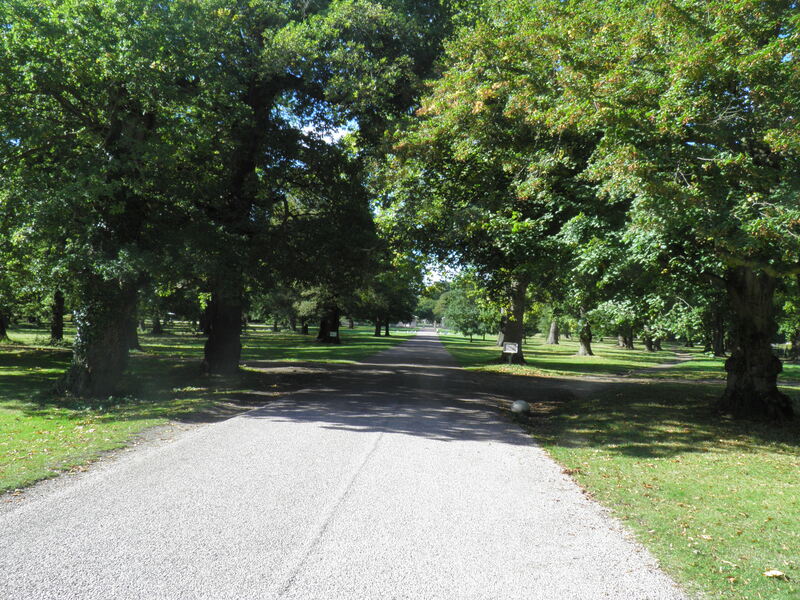 Turn left through the deer park gate and keep straight ahead at a junction beyond, into Windsor’s estate lands. 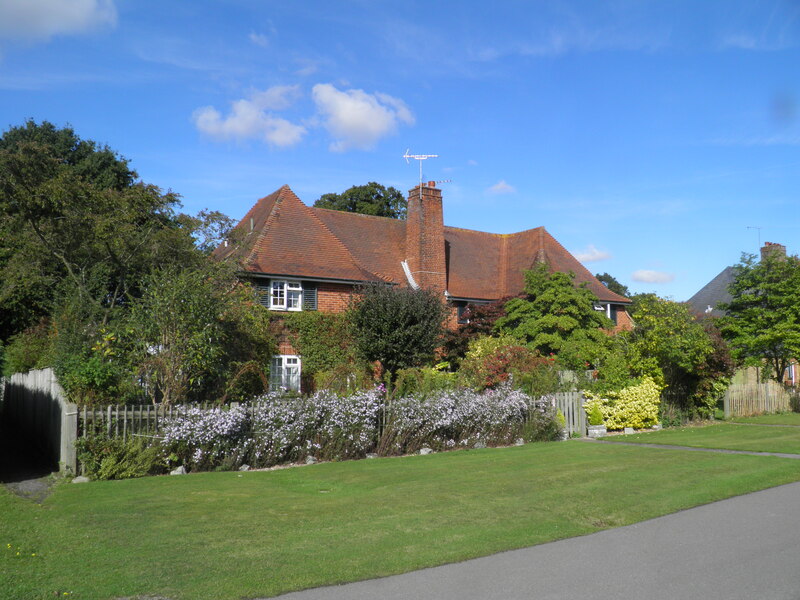 Just beyond a house, take road to left into The Village, a group of estate houses built in the 1930s around a huge village green. Take the right hand road along the side of the green. At the end, turn right again, past the pretty little post office and general store. 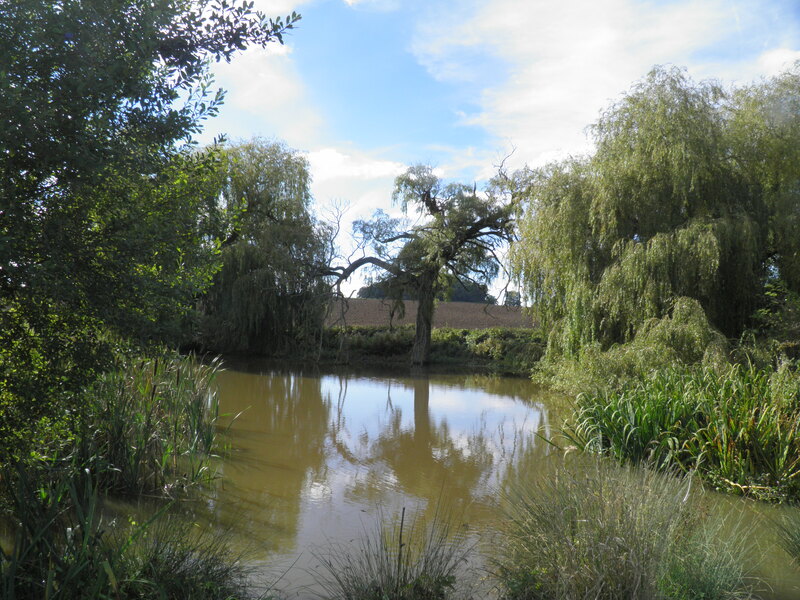 Past Shop Pond, follow the road round to the left, then at a crossroads turn right. Keep straight ahead at the next junction. The road gradually drops, past whitewashed Ranger’s Lodge, to gates leading out onto the A332. Just before the gates, turn left on a path down to a pedestrian crossing (with horse crossing beside it). Over the road, turn right past a little car park and then follow the path paralleling the main road, separated from it by a hedge. Beyond a dip, the path begins to edge away from the road, cuts through some trees, then runs along edge of the grassy cavalry exercise ground. along it. The track cuts over the grass, past a model aircraft flying area (coincidentally, Heathrow’s control tower is visible directly ahead). Re-joining the main road, cross and take the track opposite, signed to ‘Parking Area’. Where this track crosses an avenue of small trees, head L along it – this is Queen Anne’s Ride. in 1993, with the Association of High Sheriffs donating 1000 oak trees to mark 1000 years of the office of High Sheriff. 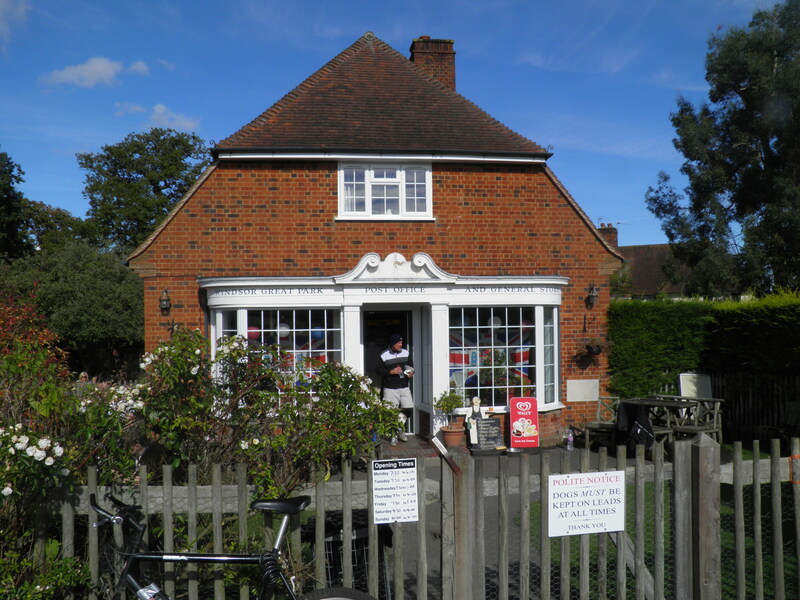 The ride returns you to the main road by a pink cottage, in front of which you turn right to pass through a gate (marked with a ‘Cycles prohibited’ sign) and onto a path between the park fence and woodland. Another gate leads you out into Long Avenue, where you turn left, towards the castle. About half way to the castle, the busy A308 cuts across Long Avenue. Cross and continue straight ahead. Windsor Castle is the longest continually-occupied royal palace in Europe, having been used by monarchs since Henry I in the early 12th century. There has been a castle on this site since the time of the Norman conquest, when William I constructed a fort here as part of a defensive ring of motte and bailey castles around London. It had the specific role of guarding a strategically important point on the Thames, with the castle sited on a commanding bluff above a curve in the river. After withstanding a long siege during the First Baron’s War in the 13th century, the castle was slowly transformed into a luxurious royal residence, containing architecture from a wide range of periods. Charles II rebuilt much of the castle in baroque style, followed by further major renovations and rebuilding by George III and IV during the early 19th century. 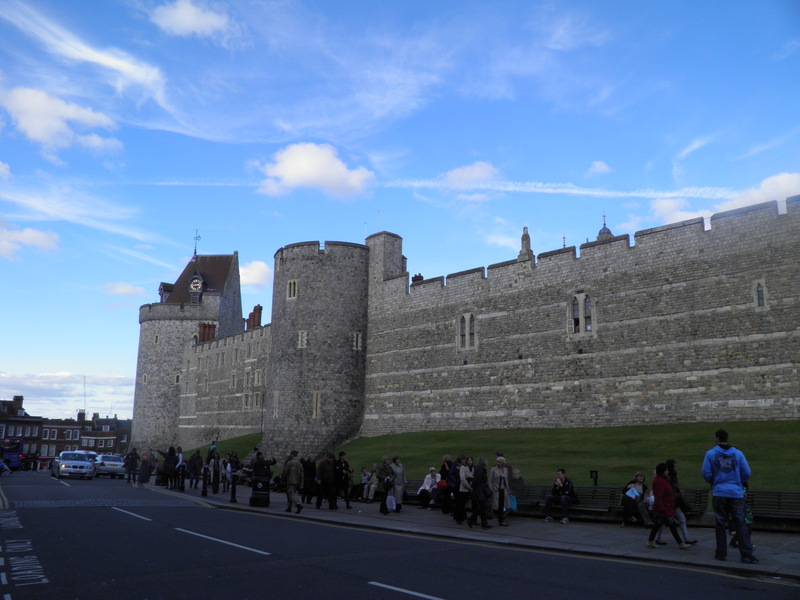 From Victoria onwards, Windsor became a centre for formal entertainment by the royal family, and is still frequently used for receiving foreign heads of state. The castle survived a major fire in 1992.
war memorial, keep straight ahead onto Windsor’s main street, past the parish church and Guildhall. Whilst Windsor has had a guildhall from at least the 14th century, the current building, supported on columns to provide sheltered room underneath for corn markets, dates from the late 17th century, having been completed by Sir Christopher Wren following the death of the original architect. 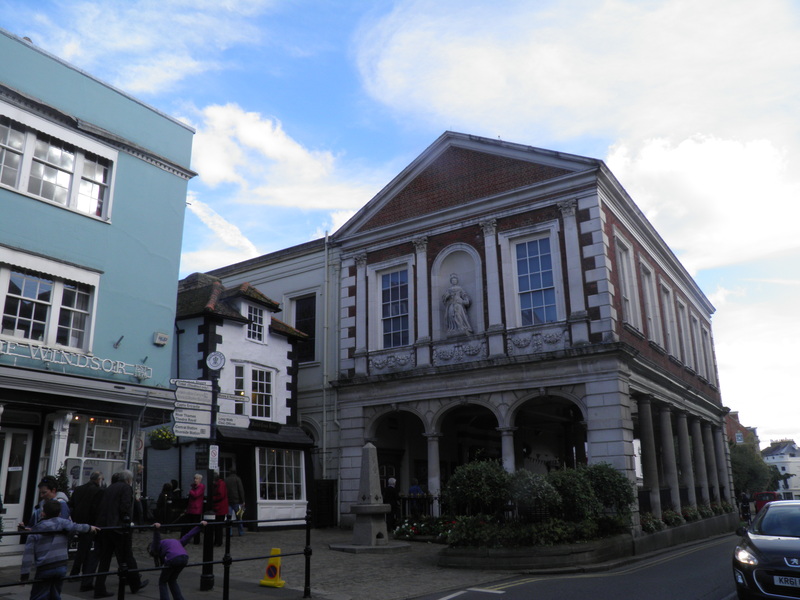 It was the centre of administration for Windsor, and is still the base for the Royal Borough of Windsor & Maidenhead’s ceremonial events, as well as the borough museum. In 2005, Prince Charles and Camilla Parker Bowles married at the Guildhall. Cross the main street at the pedestrian crossing beyond the Guildhall and continue along the street, now beside the castle. Central station is to the left, tucked inside what is now the Windsor Royal Shopping Centre. 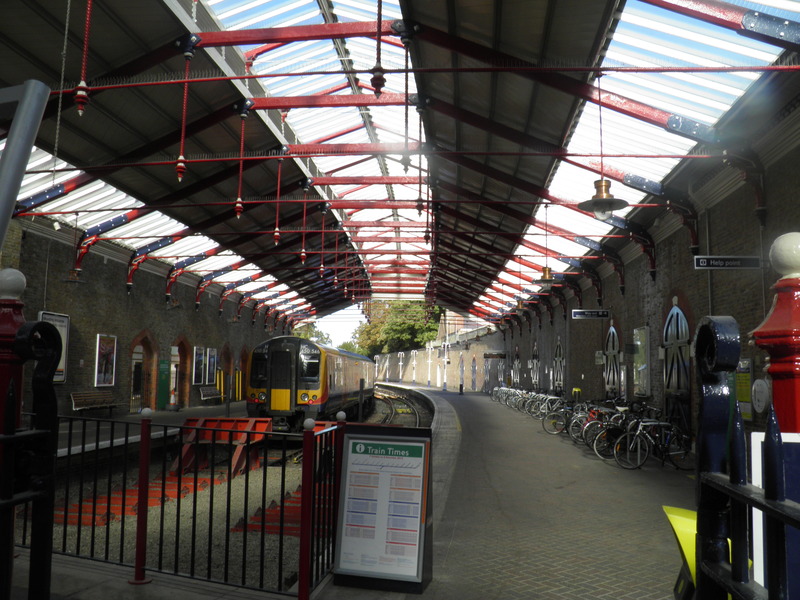 The grand entrance and curved roof of what was Central station demonstrate the historic importance of the station as a royal arrival point at Windsor – the building you see today dates from a complete reconstruction of the station by the Great Western Railway for Queen Victoria’ Diamond Jubilee. The railway portion of the station has gradually been reduced – for a while most of the site functioned as a Madame Tussauds re-creation of the station in its heyday, including a replica steam locomotive which is still in place. Most of the station is now a retail centre, with a short single platform at the far end for shuttle services to Slough. For Riverside station, continue downhill. The road, lined with a range of historic houses and shops, curves to the right. Keep straight ahead past the Theatre Royal and swing left. At the junction, cross at the pedestrian crossing and turn right on Datchet Road. The railway station is just ahead.